He described the injury as an awkward fall. Gallant confirmed he expects Marchessault to play Tuesday against Chicago. Erik Haula – Skated on Saturday in a red “no contact” jersey prior to the morning skate for the game on Saturday. Joined full practice, still wearing red, today. Marc-Andre Fleury – There is no update beyond what we already know. He is reevaluated every day and will return when he is fully cleared. There is absolutely no timeline on his return. Malcolm Subban – Subban was injured midway through the third period of Saturday night’s game. On the ice, it appeared to be a lower-body muscle or ligament issue as it was a non-contact injury. The Golden Knights are expected to place Subban on IR and recall Maxime Lagace later this afternoon. They also said he will be reevaluated this afternoon and an update may be available. He is going to be out at least a week. Sportsnet’s John Shannon reports a team source told him Subban will be “probably out for weeks.” For more on the Golden Knights goalie situation, click here. The deadline to cut the roster down to 23 was today at 2PM PST, however, as you will notice by some of the names omitted, one in particular, it’s safe to assume this will not be the 23 players boarding the plane to Dallas. So, here’s what was submitted to the league today. Before you go throwing a fit, yes, Vadim Shipachyov is not on the roster… right now. 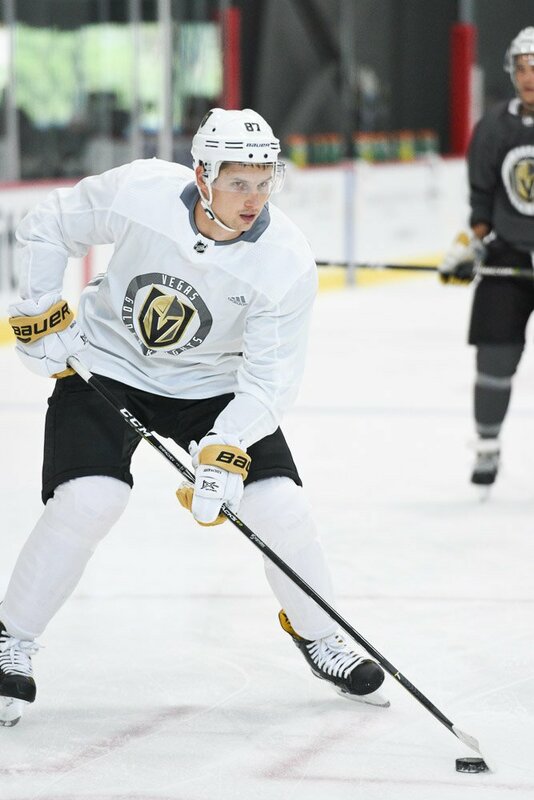 Shipachyov is one of three players who remained in Golden Knights training camp with waiver exempt status. Therefore, he is officially being assigned to Chicago without any risk of the Golden Knights surrendering him to another team. However, we can confidently say (like, beyond a shadow of a doubt) a move or moves are coming in the next two days that will free up a roster spot. 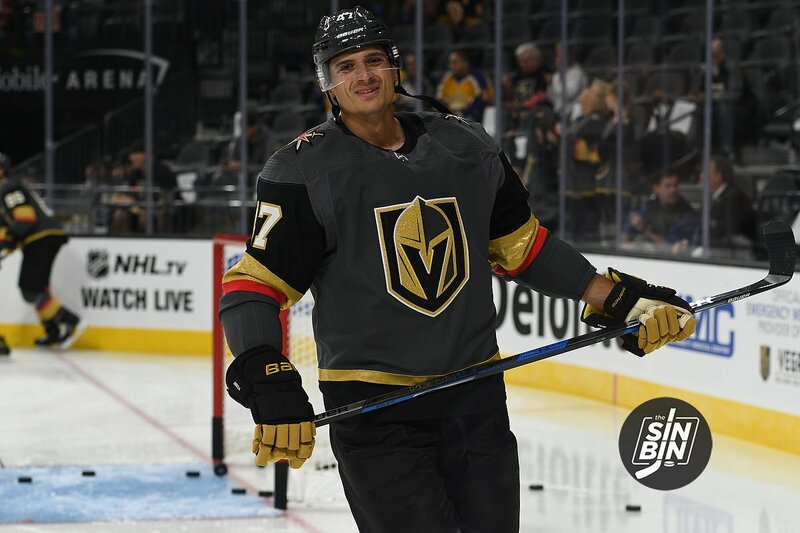 This will allow George McPhee and the Golden Knights to bring Shipachyov “back” from the AHL before the game on Friday in Dallas. Erik Haula gives details of the experience of the players who were locked down at Cosmopolitan during the shooting at Mandalay Bay. We were at the restaurant until about 1:30, we weren’t out of the casino until about 3 AM. Our security guys came and picked us got us and brought us home. We got home at around 4:30 AM. In total 10 players and a few of their girlfriends/wives were at the restaurant during the incident. A few other players indicated that they were at home at the time and coach Gerard Gallant was picking his daughter up from the airport. All Golden Knights players, coaches, and staff are accounted for and safe. Interviews from Deryk Engelland, Nate Schmidt, Brad Hunt, Alex Tuch, Colin Miller, Brayden McNabb, Jon Merrill recounting Sunday night. James Neal has come out on the ice NOT wearing red. He's not playing tomorrow, but that's a great sign for 10/6 and 10/7. Neal broke his hand in the first game of the Western Conference Finals. He had offseason surgery following the Stanley Cup Finals. The first day he hit the ice at City National Arena was September 21st. Every practice he’s participated in since he’s worn red “no contact” gear. Update: Chris Casto cleared waivers on September 23rd. He should not have been counted in this list. The Golden Knights made another round of cuts including sending training camp darling Tyler Wong out of camp to the Chicago Wolves. Others to be cut yesterday were Jake Bischoff, Keegan Kolesar, and two goalies Maxime Lagace and Oscar Dansk. With just 10 days until the season opens in Dallas the Golden Knights are now left with 34 players in camp to fill out a roster of 23. In numerical order, here’s who remains in camp. We’ve yet to see Neal practice with the team, but he was skating with Leipsic before practice yesterday. Duke has been out since the second rookie game in El Segundo and is likely still in Vegas to get the best treatment on his shoulder injury. McNabb blocked a shot in the preseason game on Sunday in Anaheim which kept him out of practice yesterday. He is expected to be fine and back in practice tomorrow. Yesterday, Thompson, Tynan, and Casto were not on the ice at practice and are not in the roster tonight, transactions have yet to be announced. If you take out the three who were missing yesterday plus Duke. That leaves us with 30 players. Leipsic is expected to be healthy enough to play in the final preseason game or two so he’s certainly still in the running for a spot. Neal, on the other hand, is a bit more of a question mark. If he can’t go, we’re down to 29. Without Neal, the breakdown is 16 forwards, 11 defensemen, and two goalies. The team is expected to keep 13 forwards, eight defensemen, and two goalies. Check out our projected 23 man roster here. 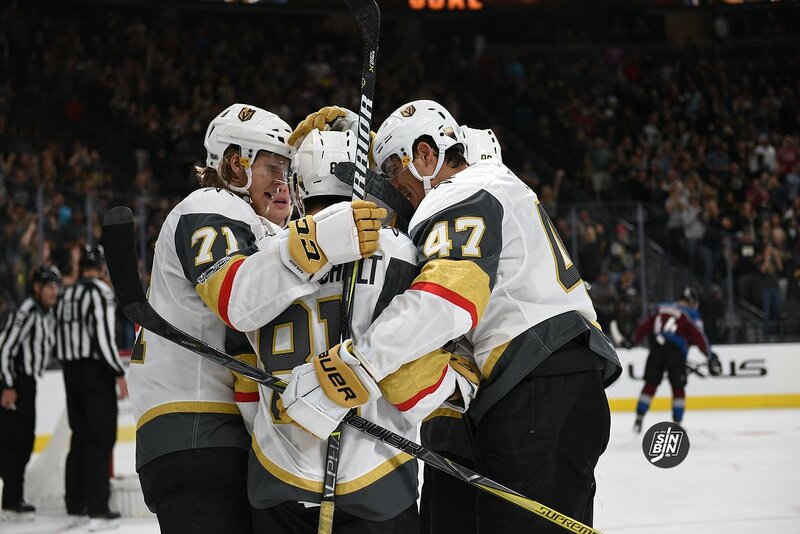 We’re not completely out of the woods, but a huge hurdle in the race to get the Golden Knights in every home in the Vegas valley has been crossed. CenturyLink announced today AT&T SportsNet Rocky Mountain will be added to their Prism TV channel lineup starting on September 15th. 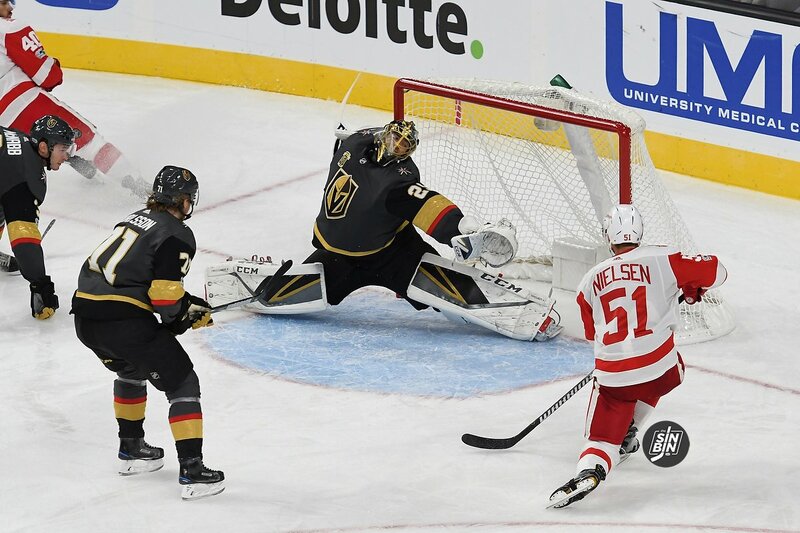 The channel will be available across every TV package CenturyLink provides, so Golden Knights games will immediately be available to all current Prism TV subscribers and new subscribers will not have to pay an added “sports package” fee to watch VGK games. CenturyLink is currently the second largest cable provider in the valley, reportedly well behind Cox, however, they do offer service to every home in Las Vegas and Henderson. So now, even if Cox doesn’t reach an agreement, AT&T SportsNet is officially available to every household via CenturyLink’s PrismTV, DirecTV, and Dish Network. AT&T SportsNet Rocky Mountain will be available on channel 760(SD)/1760(HD), available to all subscribers, starting one week from today. The first preseason game is nine days away and the first regular season game in Golden Knights franchise history will be played in Dallas 28 days from today. With Training Camp less than two weeks away the Golden Knights have released the jersey numbers for the inaugural roster. Here they are.